The objective of the BIG IoT project is to ignite really vibrant Internet of Things (IoT) ecosystems. We will achieve this by bridging the current interoperability gap between the vertically-oriented IoT platforms and by creating marketplaces for IoT services and applications. Despite various research and innovation projects working on the Internet of Things, no broadly accepted professional IoT ecosystems exist. The reason for that are high market entry barriers for developers and service providers due to a fragmentation of IoT platforms. Developers who want to make use of smart objects hosted by various providers need to negotiate access to their platforms individually and implement specific adapters. Since the efforts to negotiate individual contracts often outweigh the possible gains, platform providers do not see strong incentives to open their platforms to third parties. The goal of this project is to overcome these hurdles by Bridging the Interoperability Gap of the IoT and by creating marketplaces for service and application providers as well as platform operators. We will address the interoperability gap by defining a generic, unified Web API for smart object platforms, called the BIG IoT API. The establishment of a marketplace where platform, application, and service providers can monetize their assets will introduce an incentive to grant access to formerly closed systems and lower market entry barriers for developers. The number of connected smart objects will exceed the number of humans using the Internet in the near future. With the here proposed approach based on the generic BIG IoT API, an IoT ecosystem will come to life, as it will offer a functionally rich but at the same time easy way to discover, access, control, manage, and secure smart objects. The API will be designed in an open community process and the project consortium will engage with current standardization initiatives to receive input and deliver contributions to specifications. The BIG IoT API will be implemented by overall 8 smart object platforms. To foster the external implementation of the BIG IoT API the project will conduct focused dissemination and exploitation activities to leverage the developer community. Further, an Open Call will be conducted as part of the project to engage SMEs in the implementation of the services, applications, and platforms conforming with the BIG IoT approach. Following an evolutionary and agile approach, the developed technologies will be concurrently demonstrated in three large-scale regional pilots involving partners with strong relation to public authorities. Under a common theme of smart mobility and smart road infrastructure, various use cases within the pilots will validate the developed technologies. The BIG IoT consortium is well suited to reach the outlined goals. 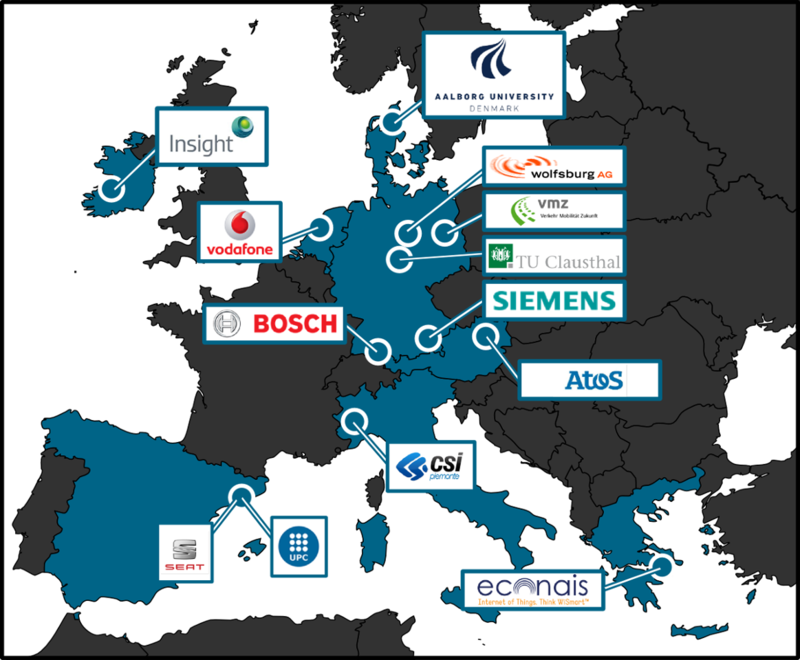 Among the partners are smart object platform providers (e.g., CSI, Vodafone, VMZ, Wolfsburg AG) who will implement the BIG IoT API. 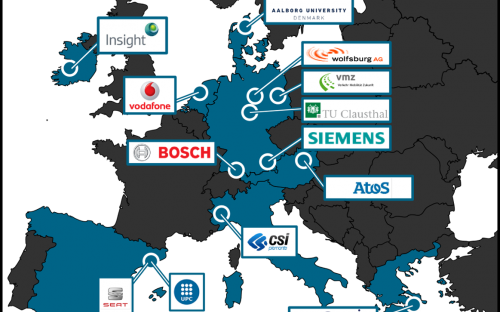 Smart object manufacturers (Bosch, econais) will implement the BIG IoT API on the device level. ATOS, as an IT service provider with experience in the development and operation of B2B marketplace infrastructures will implement the BIG IoT marketplace. Large enterprises from different domains (Bosch, Seat, Siemens, Vodafone) will contribute requirements and will design the architecture and API from their perspectives. Four universities (Clausthal University of Technology, National University of Ireland Galway, Universitat Politecnica de Catalunya, Aalborg University) with excellent expertise from across Europe will help to transfer the state of the art into the state of the practice and solve the open research challenges. This project has received funding from the European Union’s Horizon 2020 research and innovation programme under grant agreement No 688038.